Jason Becker has announced details of his new album, Triumphant Hearts. It's released on December 7, and was funded by a Pledgemusic campaign that raised $115,000 to cover recording costs. Becker has also released the first track from the album, the nine-minute epic Valley Of Fire, which features contributions from "The Magnificent 13", better known as guitarists Steve Vai, Joe Bonamassa, Paul Gilbert, Neal Schon, Marty Friedman, Michael Lee Firkins, Mattias IA Eklundh, Greg Howe, Jeff Loomis, Richie Kotzen, Gus G, Steve Hunter and Ben Woods. Full tracklist details below. In November 2017, Becker told his Pledgemusic followers, "Valley of Fire is a place an hour away from Las Vegas, where my family vacationed when I was young. This piece has a very spaghetti western/Ennio Morricone feel. It was written specifically for guitar players to do their thing on." Other musicians featured in the album include violinist Gluaco Bertagnin, cellist Hiyori Okuda, Act Of Defiance guitarist Chris Broderick, Guthrie Govan, Uli Jon Roth and Trevor Rabin. In 1990 Becker was diagnosed with ALS (Lou Gehrig’s Disease) a week after joining David Lee Roth's band, but still managed to record one album with the band before being replaced. 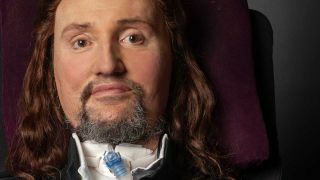 Ever since, despite declining health (Jason can no longer walk, talk or play guitar, and needs assistance to breathe), he has continued to make music, and in 2012 was the subject of the documentary, Jason Becker: Not Dead Yet. Becker communicates using a system devised by his father that allows him to spell out musical notes and chords as well as words. This information is then fed into a computer, where the parts are edited before the music charts are sent to his collaborators. "Some people feel sorry for me,” says Becker, “and I understand that. I really feel lucky though. I don’t miss playing guitar anymore. I’m sure that’s out of necessity, but I am grateful for so much more. I am surrounded by loving people, and I can still make music." For more information about ALS, which kills six people per day in the UK and remains incurable, visit the Motor Neurone Disease website.